Behind the Stories features perspectives from the reporters, editors and producers who create NPR's journalism and programming, offering insights into how and why they do what they do. For this post, we spoke with Latino USA's Andres Caballero in order to answer a listener's question about his Livin' Lagordiloca story. The first time I heard "Lagordiloca" was through an article a friend of mine sent me. She seemed like a larger than life character who was stirring up things in her Texas hometown. She seemed like someone who had found a purpose in citizen reporting and was pursuing it with full force and conviction. 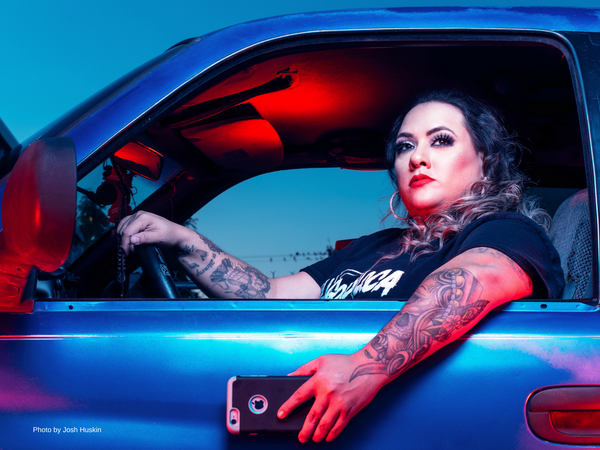 I wanted to find out more about who she was and what drove her to get in her giant blue truck looking to cover crime scenes, immigration raids, and other happenings in the late hours of the night. I wasn't sure whether or not she really believed in what she was doing or if she was simply trying to entertain or grab people's attention. After my first failed attempt to reach her, I left a message. She called me back late at night – which made a lot of sense since she slept during the day, according to what I had read. On the phone, she invited me to join her the following weekend at a parade she was going to be a part of. Regardless, all of this was enough to convince my editor and senior producer that it was worth getting on a flight to Laredo and find out what she was really about, why she was garnering so many followers so quickly. What challenges did you have while reporting the story? The most difficult part was getting a hold of her and locking down a day and time to meet for an interview. There were a few obstacles - she slept most of the day. She was extremely busy preparing a float she needed decorated for the parade. She was in the middle of a legal standoff with the city's police department. And when I finally heard back from her she had been hospitalized with pneumonia. I was only going to be in Laredo for about four days and I didn't want to be "that reporter" and pressure her to record with me when she was feeling sick. A couple of days later she called me to tell me that she was out of the hospital. And that she would be pulling up to the hotel to pick me up in her blue lifted Dodge truck aka the blue demon. That's when I regained hope that there may be an audio piece in the making. What lessons did your time reporting on story teach you? I only spent about three days with Lagordiloca but one thing that really stuck with me was that when a person struggles through most of their life, with different setbacks, loss and anguish, finding a new purpose and pursuing it aggressively can change everything for them, and sometimes – like in this case – for the community around them. Someone who truly believes that what they are doing is good, can have a huge impact in their environment. Lagordiloca was at the epicenter of this process. While being able to challenge her shortcomings as a citizen reporter, she became human, imperfect, but also larger than life, inspiring character who had an epiphany, and nothing or anything could stop her from being the eyes of Laredoans, while most of them slept, of becoming Laredo's own Nightcrawler. Don't miss out on the latest NPR news and behind-the-scenes happenings! Subscribe to our weekly newsletter and get the top stories from NPR Extra delivered straight to your inbox! Follow us on Twitter for the latest corporate news, stories behind the stories, and the occasional NPR-related joke.